Mrs. Amanda Martha Knox occupies an excellent ranch property two and a half miles southeast of Boise. She is the widow of George D. Knox, who followed farming on that ranch and there passed away May 24, 1911. Mrs. Knox was born in the Shenandoah valley of Virginia on the 4th of January, 1850, her parents being Thomas Jefferson and Mary (Mowry) Knotts. 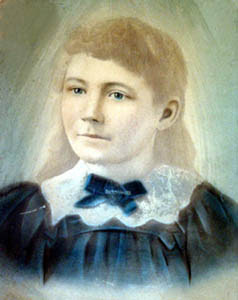 During her early girlhood she accompanied her parents on their removal to Washington county, Iowa, and was there reared to womanhood but was not yet twenty years of age when she became the wife of George D. Knox. Later she accompanied her husband to Mitchell county, Kansas, where they lived for some time, removing from the Sunflower state to Idaho about 1890, at which time they settled at South Boise. Later they took up their abode upon the ranch southeast of Boise, where Mrs. Knox now resides, and throughout the intervening period to his death Mr. Knox was engaged in general agricultural pursuits there. 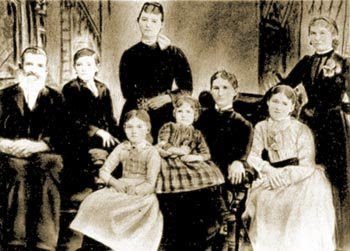 To Mr. and Mrs. Knox were born six children, a son and five daughters: Louisa, now the wife of George W. Butler, of Boise; Elva May, who gave her hand in marriage to Edward E. Butler, a brother of George W. Butler; Edith, who is the wife of Henry Dalrymple; Charles Bruce, who is a farmer of Canyon county, Idaho; Martha Ann, who is the widow of William H. Fease; and Jennie, who became the wife of Edward Bush, both she and her husband being now deceased. The last named left one child, Edna Letha Bush, who was born December 10, 1901. She is now a young lady of eighteen years and since the death of her mother has lived with her grandmother, Mrs. Amanda M. Knox. The family is one of prominence in the community, enjoying the warm friendship and regard of all who know them. 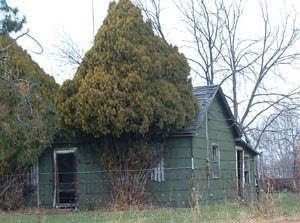 Mrs. Knox has long lived in this district and has therefore witnessed much of its development and progress, her memory constituting a connecting link between the primitive past and the progressive present. Amanda Martha Knox was my great, great grandmother on my mother's side, and I'm willing to bet that she is the only one in my family to have ever made it into a history book. But although the author suggests that her memory constituted "a connecting link between the primitive past and the progressive present," very little of my great, great, grandmother's primitive past filtered down to my progressive present. I've mentioned my little forays into my family history through amateur genealogy. I have managed to piece together some of Amanda Knox's story. And although it may not be part of the mythic wild, wild west I've been focusing on (a predominately male-centric west as Shandi pointed out), I think it represents the real west of the common people and one with more of a matriarchal bent. 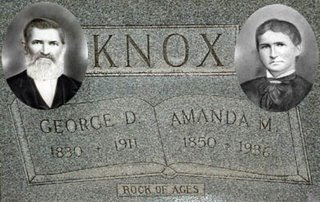 Amanda was only 20 years old when she married 40-year old George Dawson Knox who had only been honorably discharged from the Iowa Volunteers four years earlier after a stint with the Union Army fighting in the Civil War. George had migrated to Iowa from Ohio. His parents were from Pennsylvania. If you look at a map of the United States you can see that he was following a strong tide that was sweeping steadly west. How my great, great grandparents met and most of George's history are lost somewhere in the chaos that followed the war. After getting married, they migrated to Kansas where I believe all of their six children were born. 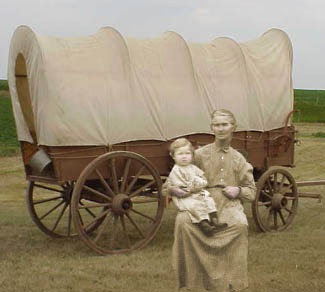 Again, the only thing that is certain about what took them to Idaho in 1890 is a wagon. The youngest of their children (shown above sitting on Amanda's lap) was Ada Janette Knox, my great grandmother. She was barely six years old when George and Amanda moved their family west to Boise, Idaho to "engage in general agricultural pursuits." They lived on a ranch southeast of Boise. If you are unfamilar with Boise (as most people are), it is situated in a valley carved out of the desert by the Boise River. Legend has it that a French trapper stumbled out of the sagebrush desert into the wooded valley and cried, "Le bois, le bois...," -- the trees, the trees. So Boise is the City of Trees (though many have been cut down as part of our progressive present). I somehow inherited portraits of of the Knox family after my grandmother died. My mother ended up with them and passed them quickly to me, knowing I was one of the few in the family that looked backward in time as much as forward. This is a portrait of my great grandmother Ada or "Jennie" as she apparently liked to be called. She was likely not more than 17 when the photo was taken and I find it odd referring to this lovely young woman as my great grandmother. Soon after this portrait was done, 17-year old Jennie ran off and married 27-year old Edgar Ellsworth Bush in May of 1901. Seven months later, in December of 1901, my grandmother, Edna Letha Bush, was born (and yes, I've done the math and can guess why Jennie ran off to get married). I know very little about Edgar Bush, other than he was born in Missouri and may have been a farmer. But after two years of marriage, 19-year old Jennie died giving birth to a baby boy. The baby also died soon after. Edgar quickly remarried and left my grandmother to be raised by her grandparents. Edgar and his second wife died ten years later of tuberculosis. My grandmother only saw her father a couple of times before he died. My mother relates only sketchy bits of information about my grandmother's life on the ranch with her grandparents other than she was isolated and lonely. Apparently she was so lonely she ran off when she was barely 18 with one of her grandparent's ranch hands, Raymond Sylvester Clark. By that time, George had been dead for eight years. Edna didn't run far. Raymond apparently had very few ambitions (including work). They ended up on some property adjacent to what was left of Grannie Knox's ranch living in a tent. Although Raymond wasn't much on working he did, father 13 children, the third oldest being my mother, Jenny Ruth Clark. Some kind neighbors got together and built a one-bedroom house next to the tent to provide the family with some more permanent shelter. The house is still standing (or was last Thanksgiving when I snapped this photo). 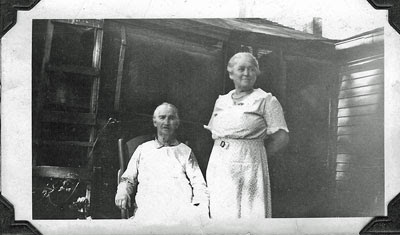 Grannie Knox died on July 4, 1936, soon after this photo was taken of her and her daughter Elva. My mother was 11 years old at the time. She remembers a strong, yet kind woman who often sat on her porch in a rocking chair, smoking a corncob pipe. Amanda was buried next to George in the Morris Hill Cemetary in Boise. Her "excellent ranch property two and half miles southeast of Boise" has long since been razed to make way for cookie cutter subdivisions. I do know that none of the property or proceeds from it filtered down to my my side of the family. I realize that this isn't an exciting story. It's a simple story of a young girl from the Shenandoah Valley of Virginia swept up in a historic migration west to Iowa, Kansas and eventually another valley in Idaho. What it is, is a real story of how the country evolved. It is also a story puzzle of my family with many pieces still missing. But before I die, I plan to do my best to uncover as much of Amanda Martha Knox's memory as possible and reconnect those pieces of my history that link "the primitive past and the progressive present." 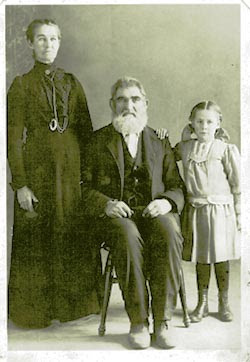 In 1850, Thomas Knotts was 31 and residing in Hampshire Co., VA along with wife Mary, age 28. Both were born in VA, as were all three of their children (at that time): Louisa age 5, Nancy age 3, and Amanda age 1. Their enumeration in the 1850 Federal Census took place in October of that year. Interestingly, he was listed as a "laborer" during a time when at least 80% of men were categorized as "farmers." But perhaps you knew all this! I'd go deeper, but I'm off to work! So Kristy, You must have paid for the access to Ancestry.com. I've been holding off. Now if you can find anything about George Knox's parents other than they were born in Philidelphia, I will be very impressed. I'm fascinated by the way you do this - much truth in the blending of modern vision with recorded facts. my own example is that my family "story" says we "went west and homesteaded in Michigan" (I still have the family homestead). The reality is that my progenitors rode the train to the end of the line, then got out and settled swampland. So intense were the malarial impacts of this decision that the local court calendar was constructed by figuring out when the marshal, judge, lawyer and whatever other police officers were involved would be likely to be having a fever-free day. now THAT, boys and girls, is a home truth about settling the "west." it ain't purty, it ain't dramatic, but its real. Hayden, So is that where the phrase, "I'm swamped at work," came from? I greatly enjoyed your family history Tim. I've never thought to research my own. This probably comes from not feeling all that connected to them. I seem to have an interest in old graveyards though and will seek out the local cememtaries when visiting a new town. I'll walk among the headstones forming stories in my mind. I'll try to locate an entire family plot. I'm always taken by how young the children die. I imagine their was a lot of grief in the old west. I read a lot of tiny headstones with names of diseases we seem to have conquered. But... I never came across an old headstone that read, "child died in a senseless act of violence" as many of our modern cemetaries seem to have. Thanks Shandi, I think family history's are kind of like vacation slide shows. You probably enjoy them more if it is yours. I'm afraid it was kind of boring for most people. I know what you mean about cemetaries though. They tell stories, but you have to fill in much of it yourself. Hi Kristy, No, I didn't get your e-mail. I'd love to see what you found. Thanks for looking. My Dad has traced my family back and he has the entire history. My daughter always wanted to be related to someone famous. The closest she came is the Sheriff of Nottinham. She kind of liked that but she wants someone really famous. But alas we are just simple folk, smiles! Great post!